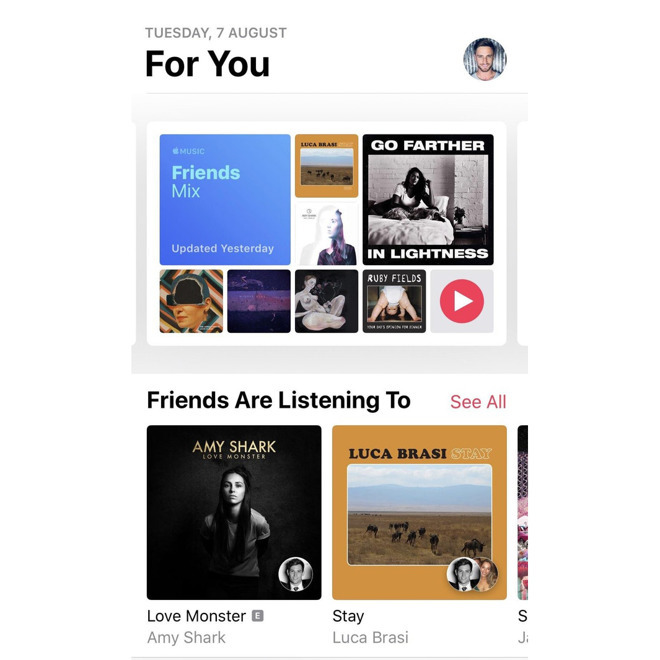 Apple has begun introducing a "Friends Mix" on Apple Music, looking to ramp up the significance of the social features it introduced with iOS 11. The playlist, found in the "For You" tab and updated every Monday, includes 25 songs that friends are listening to. It isn't yet appearing for every Apple Music subcriber, but people are highlighting the addition on Reddit and elsewhere. Apple has sometimes been criticized for a lack of fresh weekly playlists, especially when stacked up against its chief rival, Spotify. The former has Favorites, New Music, and Chill mixes that update on Tuesdays, Fridays, and Sundays respectively, but Spotify has a far larger assortment of regularly-updated personal playlists, among them Release Radar, Discover Weekly, and Your Daily Car Mix. Profiles were only added to Apple Music with the introduction of iOS 11 last September however, finally making it possible to both follow a connected friend and quickly check out their song history. A key feature of the Mac and Windows versions of Spotify is the "Friend Activity" feed, which shows what friends are listening to in real-time. This not only improves discovery but makes it possible to play the same track at the same time. Currently Apple Music isn't slated to gain many changes in this fall's iOS 12 or macOS Mojave, though surprises could conceivably be in store. Artists will simply get better profiles of their own, with bigger artwork and the option to play an entire discography with a single tap or click.